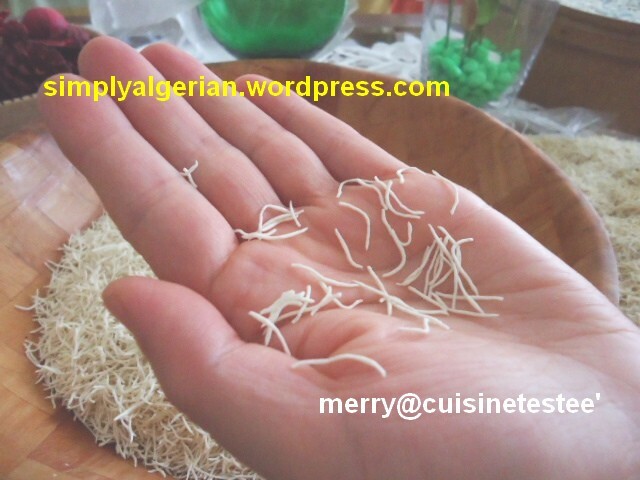 To continue my series of posts about Algerian homemade pasta, I ‘d like to shed the light on one of the finest and most difficult pasta dishes that combine both othoman heritage and the amazigh /berber cooking methods …. 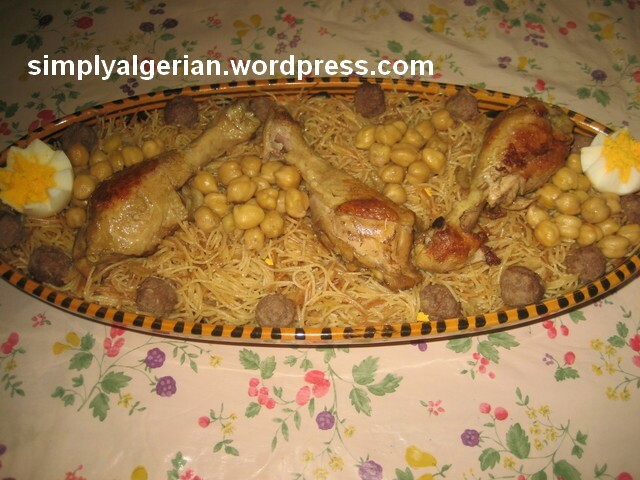 the dwida or gritliya as it’s known in my hometown, is a a type of pasta , found only in the Northen cities of Algeria famous with their othoman heritage like Annaba, constantine, Algiers…….etc…….but while the pasta preparation itself is probably Turkish influenced , the method of cooking the dish is typically berber. 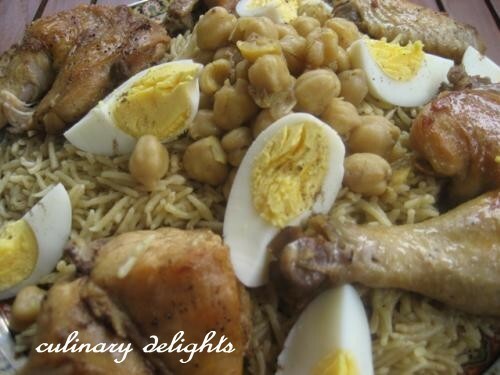 In fact, the differences between North African and Middleasten cuisine is not solely starch based ( rice versus couscous ) but goes beyond that. North African cuisine with its Berber roots is based around slow cooking using clay cookwares that provide moisture and develops flavors to the stews as well as steaming that allow two dishes to be cooked over the same source of heat. 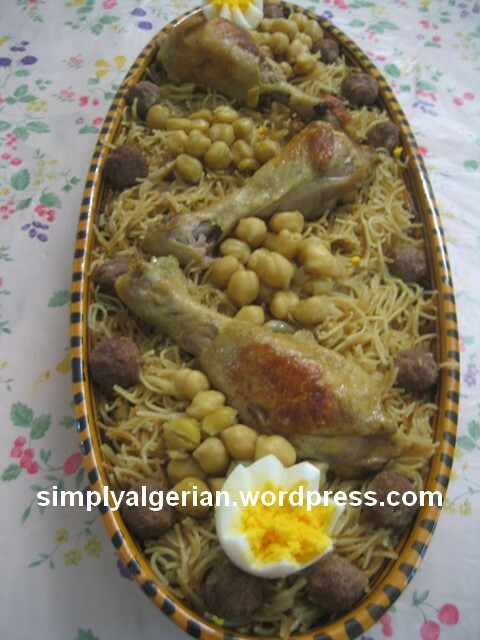 Dwida or Gritliya is a typical example of how Algerian women fused foreign inherited dishes ( othoman in this case) and giving them a local touches through the steaming technique…. the preparation of the pasta is really hard and time consuming , you need years of watching and exercising to get the right gestures . to prepare the dough, fine semoulina is gradually mixed with water and kneaded then left to rest for few hours , it is then cut into small balls, and each ball shaped into long , extremely thin cords , that would be squeezed between the tumb and the index. short, 5 cm long vermicellis are then formed and left to dry on traditional sieves before getting stored. you can see how the dwida is being shaped and left to dry on the traditional Algerian sieve called gherbal or siyar. 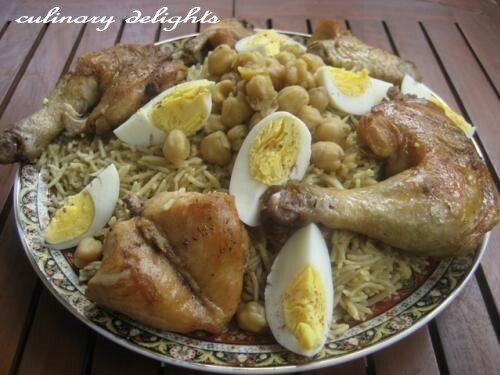 In the past,each summer , during the hot sunny days of August, Algerian women would gather and prepare big amount of different types of traditional pastas called el 3oula or el mouna ……. couscous, trida, mhamsa ( berkoukes/aich) dwida, etc………are prepared for the whole year in a very friendly and joyous atmosphere, women would sing, lough , gossip, share their marital stories or problems, while rolling a grain of couscous or cutting a square of trida…..a true sens of mutual help and fraternity framed by a typical Algerian sociological phenomenon called TWIZA . 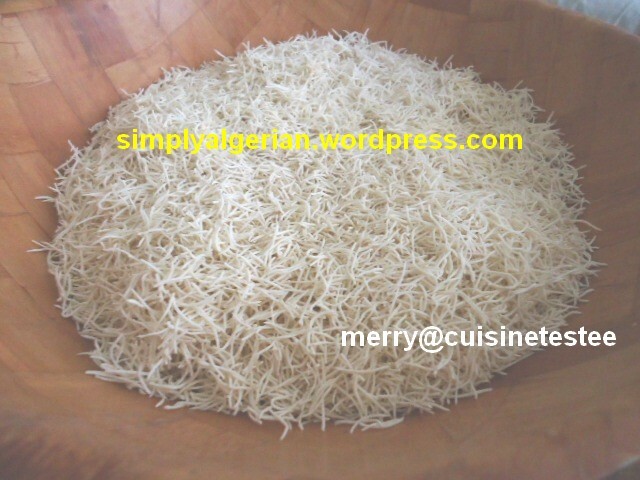 because the homemade vermicelli is not begginer friendly, you can replace it by the industrial pasta even if you would miss the authentic taste. Here are some pictures of dwida prepared with industrial vermicelli pasta. I grilled half the vermicelli on a dry frying pan until they got this goldren brown colour and mixed them with the rest of the paquet to get bicoloured pasta. small meat balls seasoned and cooked in the broth. over low heat, place the meat in the lower port of the couscous pot, brown it with the onion, ghee and species , stir continuesly, add the chickpeas and one cup of hot water. give it a few boils then pour 1 and 1/2 L hot water. let it simmer over medium heat. you may need to steam it for a fourth time but if the pasta is well steamed , 3 times should be more than enough. a fresh homemade pasta takes shorter time to get tender. when the pasta is cooked, pour it in a cooking pot , cover it with the meat broth, and let it absorb it over very low heat. i personally prefer to sprad the pasta in a gratin like dish, pour the meat broth , cover it with aluminum foil and place it in the over for 15mn to 20 mn until the pasta absorbs all the broth. once the pasta is well done. return it to a deep plate, check the seasoning, add some salt and cinnamon powder if required then a knob of butter, mix well. spread the pasta in a deep traditional serving plate , spoon the chickpean in the centre, arrange the meat , boiled eggs and meatballs around . faire revenir la viande avec le smen et les epices, ajouter les pois-chiche puis couvrir avec un litre et demi d’eau .laisser cuire. entre temps, prendre le paquet de vermicelle ,l’enduire avec un peu d’huile pour que ca ne cole pas pd le passage a la vapeur. mettre dans le haut du couscoussier et laisser 30 a 45 mn environ, verser dans une jatte, saler,poivrer et asperger d’un peu d’eau chaude .laisser absorber puis remettre a cuire une 2ieme fois . reverser dans la jatte, verser dessus, 2 ou 3 louches de sauce,laisser absorber et mettre a cuire une 3ieme fois. si la dwida n’est pas encore tendre, repasser a la vapeur pour la quatrieme fois. apres mettre la dwida, maintenant tendre, dans une marmite, verser dessus la sauce, debarasse’ de viande et de pois chiche. qui doit seulement couvrir la pate,augmenter le feu au depart, puis diminuer a fond et laisser absorber a feu tres deux. gouter la pate, rectifier l’assaisonement ou ajouter plus de sauce si necessaire. a la fin mettre une noisette de beurre dans la pate, decorer avec la viande et les pois chiche au milieu, on peut ajouter des oeufs durs et des boulettes de viande hachee’ qu’on jete dans la sauce de cuisson. 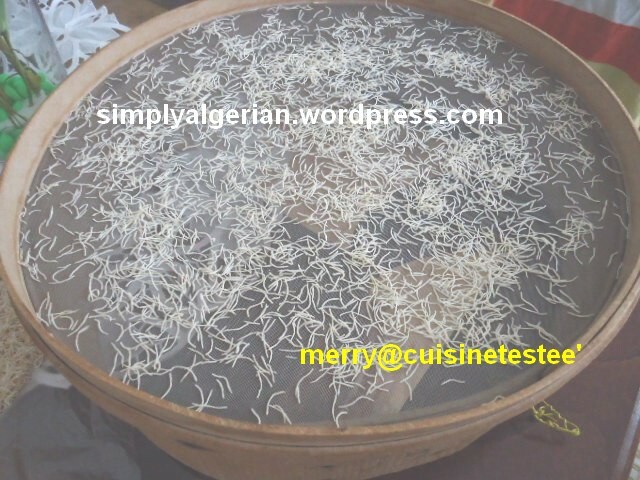 Cette entrée a été publiée dans Algerian pasta et taguée Algerian food, Algerian main dishes, Algerian pasta, Amazigh cooking, berber cuisine, dwida, gritliya, دويدة. superbe billet!! un de mes plats préférés , merci de faire connaitre nos délicieux plats! bises! yaatik essaha el habiba !! un plat bien de chez nous !! a tres bientot el habiba !! Is this the same as rishta? I love rishta!!! Not exactly. the dough preparation is the same but the form is different. rechta looks like thin tagliatelle and dwida like the vermicelli. un plat que j’aime trop! ça me rappelle beaucoup de souvenirs et de nostalgie. trés belle présentation, merci pour ce beau partage! ma belle-soeur prépare ce plat merveille. BRAVO pour cette belle réalisation et MERCI du partage ! All I can say Is MashaaAllah la quwwata illah billah. Wallahi I wish I was your neighbour lol. ouaww on se croirait vraiment au bled avec toi ;)) j’aurai aimé en manger! thanks for stopping by Elham. it’s so nice to see other english -speaking Algerian foody. je vous remercie pour ces belles recettes vous nous aidez vraiment surtout pour celle qui sont a l etranger mais j ai un petit commentaire les recettes d apres moi sont plus en anglais qu on francais c est bien de faire en anglais mais juste apres ou avant en francais ca va aider tout le monde meme s il faut en arabe aussi . pour plus de recettes Algeriennes je vous invite a jeter un coup revoir si vous connaissez deja mon blog francophone « culinary delights ». voir la section » blog roll » en haut…. merci pour votre comprehension et interet…. Les blogues en francais sur la cuisine algerienne profusent ..ce n’est pas le cas en anglais! Je parcourt avec délices tes recettes et j’en bave d’envie. Merci pour tout ce travail ma belle Kaouther. Continues à nous faire rêver et voyager à travers tes plats.